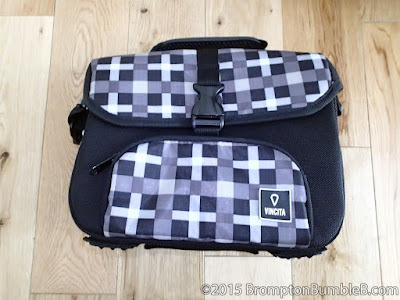 Vincita send me some of their bags to review for the Brompton. 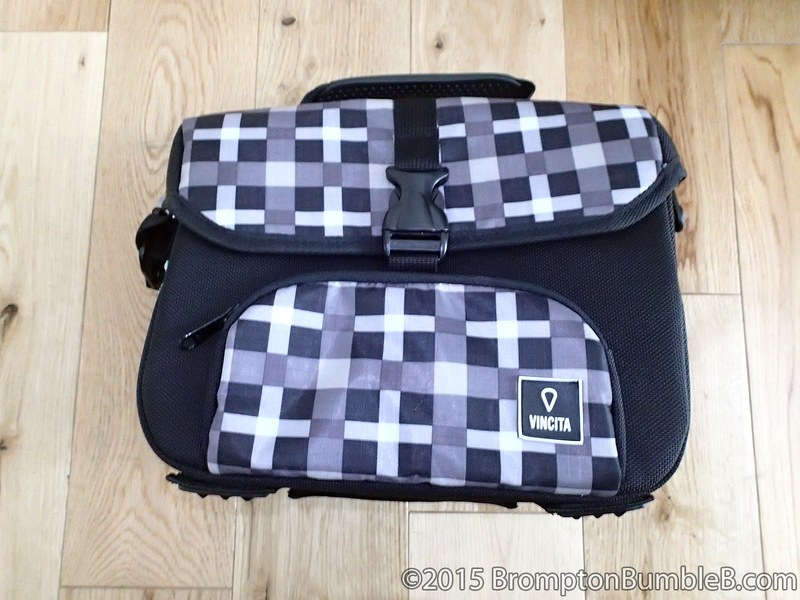 Vincita B017B "Mini Front Bag"
"A stylish and fun bag designed especially for the Brompton. 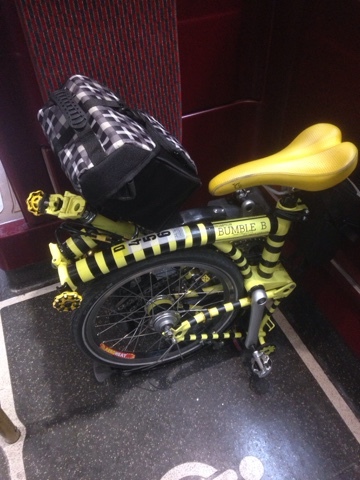 The main compartment is an ideal size for you to get around town. 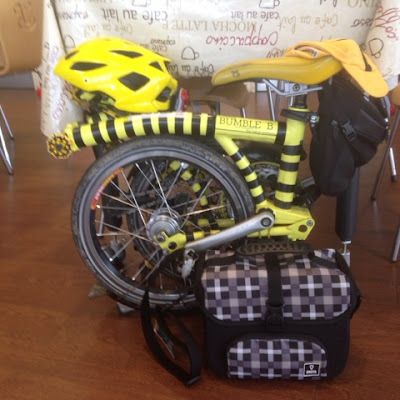 It comes with a concealable bracket (for Brompton front carrier block) and a removable shoulder strap for using when off bike. Rain cover is also included. Available in 5 colours, red with white polka dot, black&white check, black spring, red spring and chocolate spring." This small front bag is good for short day rides where you won't be needing alot of items to carry. I could get my spare set of cycling glasses, charger pack, a few energy bars, wallet, keys etc. It clips in with ease into the Brompton front block just like any other Brompton specific bag. 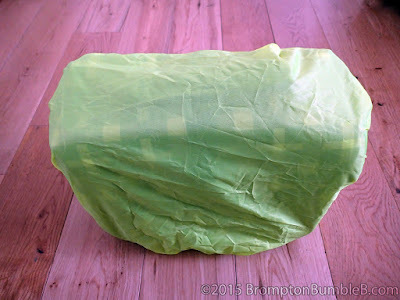 This bag isn't fully waterproof on its own but it comes with its waterproof/showerproof cover. I personally don't think this cover would be up to the job of a heavy down pour but should be enough for light showers. 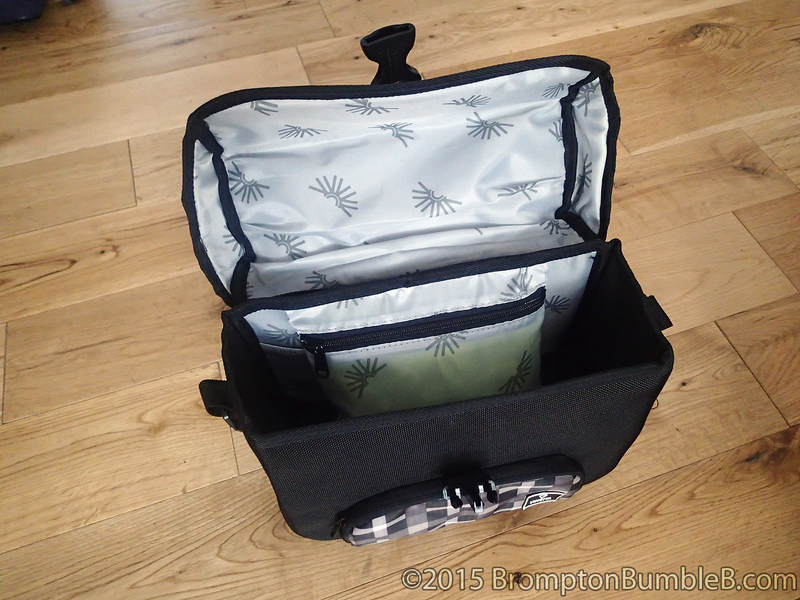 Also comes with a easy removable shoulder strap. 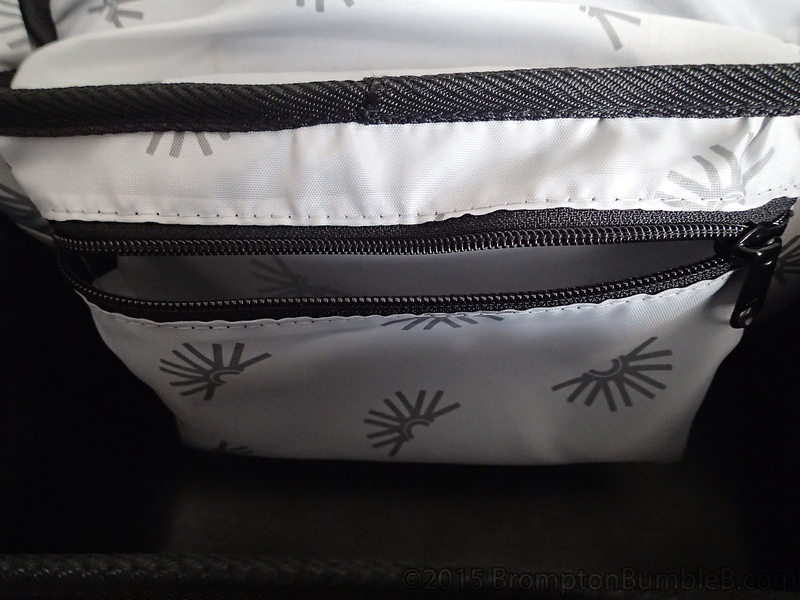 There is a small inside pocket to put keys, money or credit cards with a nice zip to keep everything together. The mounting bracket on this front bag is made out of metal which means its not as bulky as the plastic ones on the Mini O Bag. Luckily Vincita have thought about this & built in cover for the mount with this cool little flap which tucks into its own pocket. 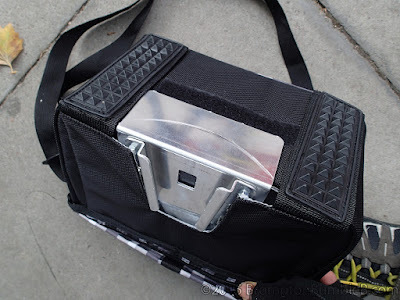 This is useful for when you use the shoulder strap so you don't hurt yourself with the metal edges, even though they are not sharp they could still do some damage. 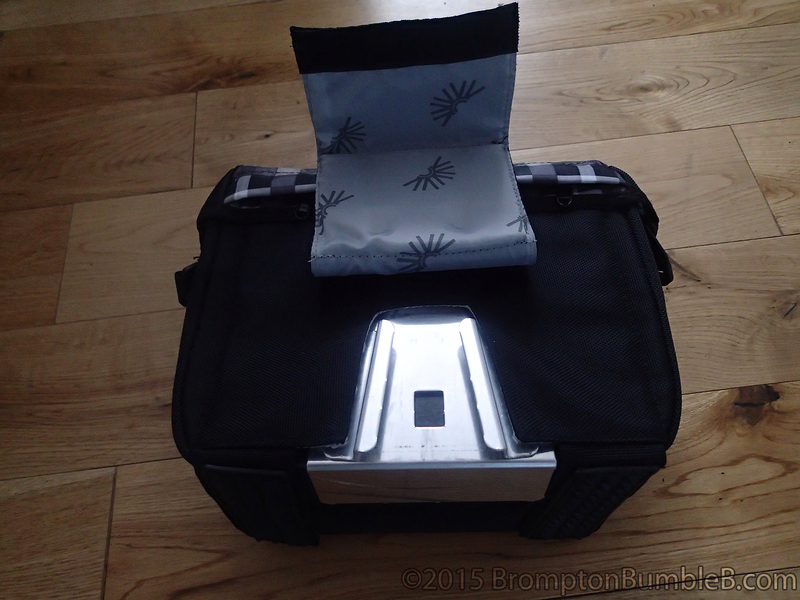 The biggest differences I found when comparing to the Brompton "Mini O" Bag is that this opens at the front not like the Mini O Bag that opens from the rear. 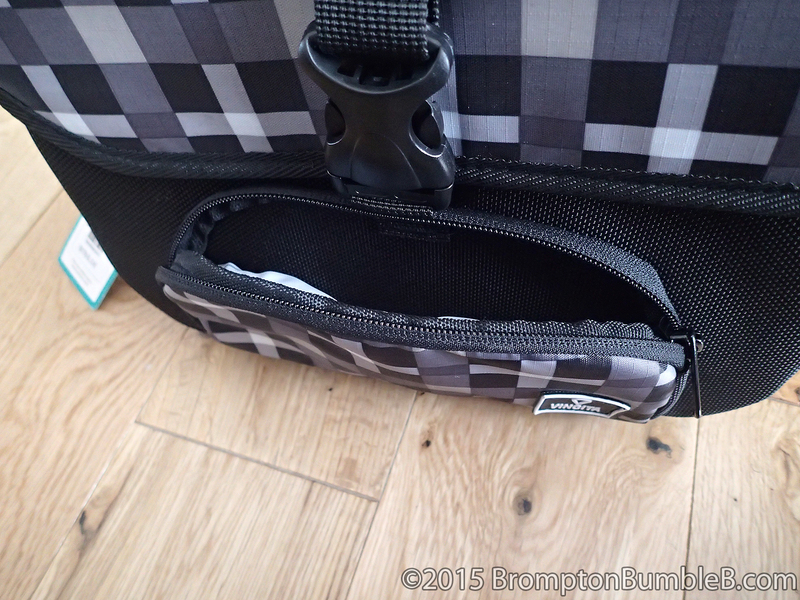 I found this a little tricky at first but didn't take long to get used to it and its snap buckle. 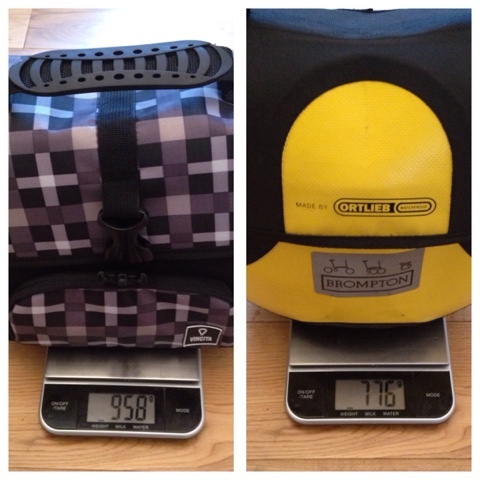 Felt smaller to me than the Brompton Mini O bag but it could be the dimensions are slightly different. Took me awhile to get used to it opening this way, I've had my Mini O Bag so long it seems second nature for it to open towards me. On a recent ride it seemed to cope quiet well. Only problem I found was that the bottom of the bag would rest on top of my SON Edelux II LED Headlight and actually turn the switch. I could adjust my headlight so it doesn't rest on the light or bend the metal mounting plate of the bag but something to look out for. 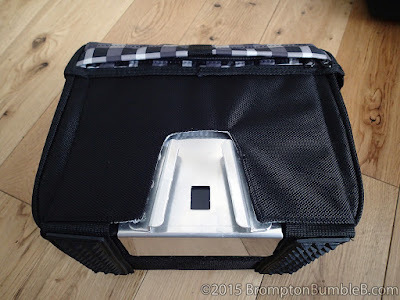 So if you have a headlight mounted under the Brompton block do check to make sure the bag is not going to rub on it which would make steering difficult. 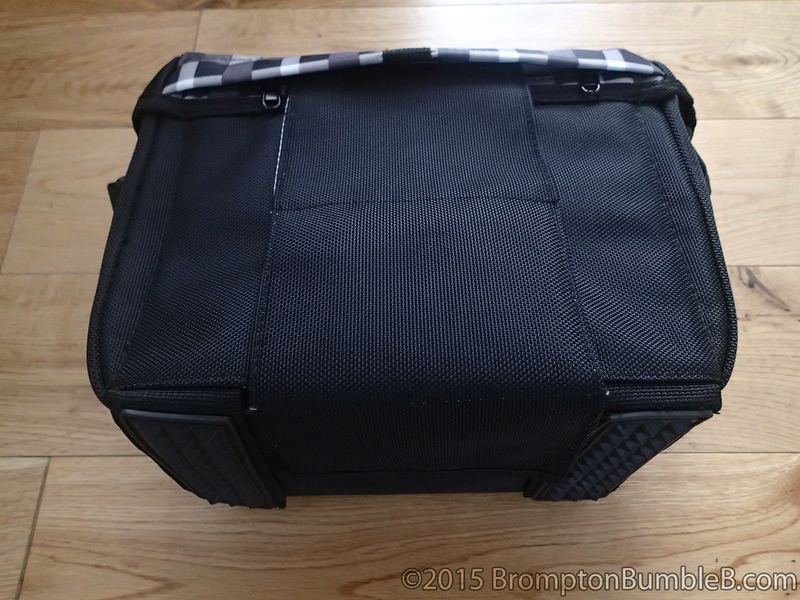 Overall it's a decent front bag for your Brompton. Not fully waterproof like Brompton's Mini O Bag & comes in different colors and patterns.